Each year, I try to buy or make significant ornaments for a collection for my children. This ornament was created to remind them that the baby didn't stay in the manger. He grew up and became the Savior who died on a cross. With one color, cross stitch the beads to form a cross measuring 16 high and 13 across. 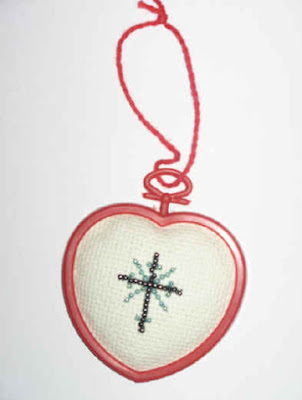 Using a contrasting color, cross stitch an X with 4 beads on each side of the cross. Also with the contrasting color, add contrasting beads to either side of the cross, 3 from each end. Use a plastic heart shaped craft frame to judge how to trim the aida cloth. (I padded mine so it would stand out more, but you wouldn't have to). Glue into frame. (I also glued a Christmas patterned fabric to the back).